--Hearing enhancement functions – including noise reduction, echo cancellation, and more. Situational Hearing Enhancement when You Need It! BeHere Now can enhance hearing for those with normal hearing, as well as people with mild to moderate hearing loss. This is true for all situations: In-person conversations, mobile phone conversations, music/audio streaming, Television viewing, movies, theater and concert performances, outdoors, in nature. 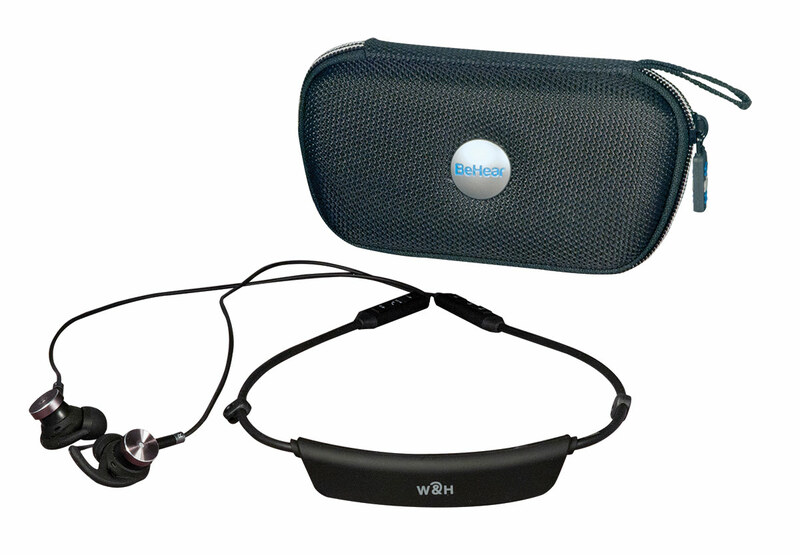 These profiles can be modified in realtime, based on the current sound environment and the wearer's preferences, using the W&H BeHear mobile application. Application includes a self-administered personal hearing assessment for automatic adjustment of the sound in each of the operational modes: ambient hearing, phone calls, and audio play, direct access to the video tutorials library, an option to set the balance between left and right ears, assistive listening functions for phone calls and media playback, various device settings, including default mode behavior, vibration alerts, and more. Application can be downloaded for free from the Google Play Store or Apple Store. Acoustic Performance: Maximal Sound Pressure Level (OSPL90), HFA: 116 dB SPL, Full-on Gain, HFA: 42 dB, Total Harmonic Distortion (THD): - 0.7 percent, Receiver Specifications, Speaker: 13.6 mm receivers, Frequency Response: 20 Hz to 20 kHz. Ultra low-noise 74 dB SNR ECM (Electret Condenser Microphone) in each earpiece, Low-noise digital 64 dB SNR MEMS in each control box, Frequency Response: 100 Hz to 15 kHz. Battery: Rechargeable single cell Lithium-Ion, Charging interface: Micro-USB, Capacity: 250mAh. LED light indicates power and hearing states. Operation Time: Hearing mode: 15 plus hours, Talk: 10 plus hours, Play: 8 plus hours, Standby: 600 hours.